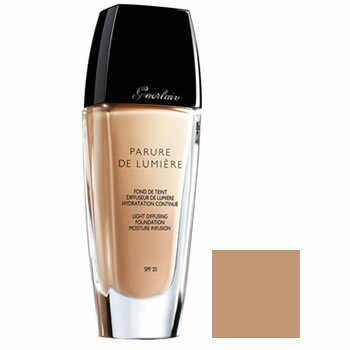 Guerlain Parure De Lumiere Foundation Fluid Beige Fonce is a medium to dark beige shade in the range. Guerlain Parure De Lumiere Fluid Foundation delivers a luminous and radiant complexion with exclusive light booster pigments that multipliy the radiance of the skin for 360 degree radiance all day. Guerlain Parure De Lumiere Fluid Foundation contains ocean water, for moisture and comfprt and nasturtium extract for freshness and vitality. This formulation treats the skin whilst it covers and makes it radiant, rosy and healthy.